Place the chicken in a gallon size zip lock bag. Add the lemon juice and marinate for 1 hour. 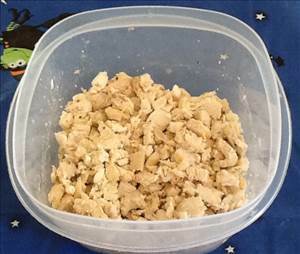 Place chicken in a 9x13" baking dish. Pour the lemon juice from the bag on top of the chicken. Cut the butter into 4 pieces. Add to baking dish. Sprinkle the lemon pepper seasoning evenly on top of chicken. Cover with foil and bake 30-35 minutes, or until juices run clear. Remove dish from oven and let cool for 10 minutes. Take the chicken and place in a medium size bowl and using two forks shred. Serve in taco shells. Note: if you think the chicken seems a little dry you can pour some of the lemon butter juice from the pan into the chicken. There are 168 calories in 1 serving of Lemon Pepper Chicken II. Calorie break-down: 40% fat, 8% carbs, 51% protein.